It is impossible to predict what the world will be like in 2050, but it is possible to shape that world. Anticipating and reflecting upon a range of plausible futures can illuminate potential opportunities and risks on the horizon. While there is more to explore, research, and learn, society cannot afford to wait until we know all the answers. 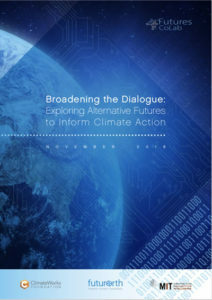 Undertaking exercises such as the one described in this report help us to challenge our assumptions about the future, identify blind spots, and assess opportunities and risks, ultimately allowing us to design and adapt strategies that are more appropriate for the changing world we will all face between now and 2050. If you would like more information about this work, please contact us: casey.cronin@climateworks.org.